"The V KICK...WOW. It’s soooo solid-sounding on the bottom end." The V KICK: Unbeatable punch & impact, with four custom voicings to cover any sonic need. From big band to metalcore, the V KICK has got you covered. The V KICK is the most compact and versatile drum microphone in its class, intended for use with kick (bass) drums and other sources such as miking bass guitar speaker cabinets, floor toms or other large drums where low-frequency energy is of the utmost importance. 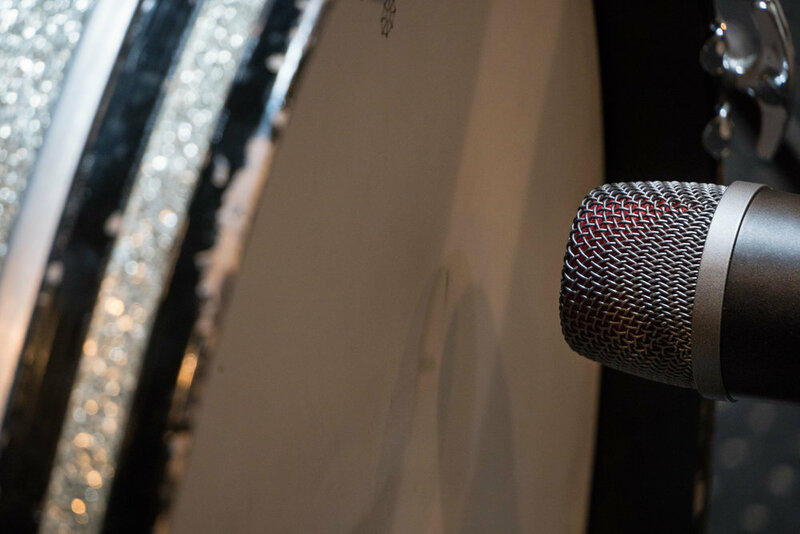 Its integrated swivel joint allows for any required mic placement, and its specialized capsule provides a sound character tailored specifically for kick drums, which can be further shaped with the use of two switches on the rear side of the microphone. 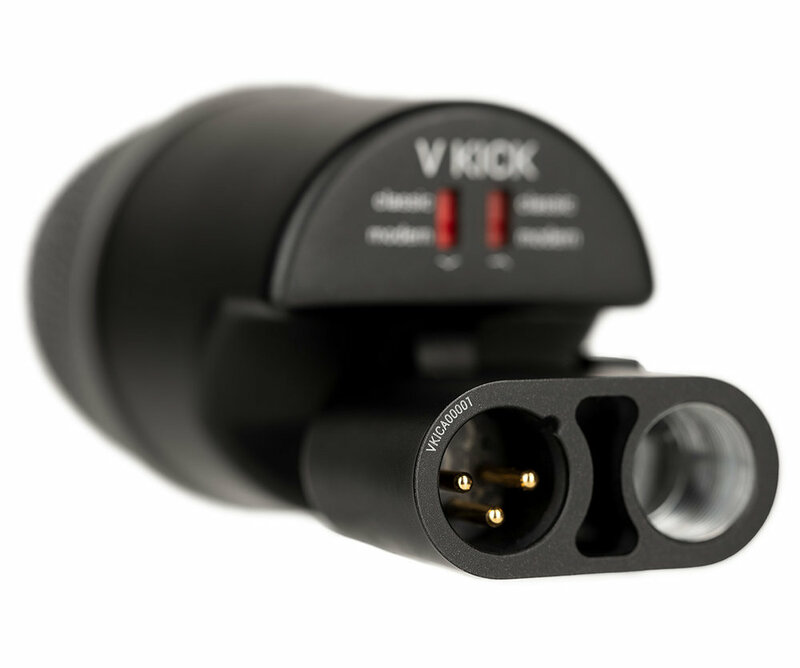 From warm and classic to modern and aggressive, the V KICK gives you any kick drum sound you need. Two switches on the rear side of the V KICK allow you four different sound settings, great for tailoring the sound for your specific project – and ideal for live shows with multiple bands and short changeovers. And since they’re on the back of the mic, these switches are still accessible even if the V KICK is placed inside a kick drum. With the V KICK, you can always make the right choice with just a single microphone. The left-hand switch shapes the microphone’s overall voicing. “Classic” provides a more traditional kick drum sound with a familiar low frequency punch and a warmer, more rounded sound. If a more contemporary, aggressive sound is desired, the “Modern” setting emphasizes the low end and high end (a “scooped” sound). The right-hand switch specifically tailors the high-frequency character. “Classic” provides a typical bite in the upper midrange (presence boost) and a more rounded and familiar sound, while “Modern” provides an open, clear and transient-rich top end for a more contemporary, aggressive drum sound - ideal for metal and hard rock. The most compact kick drum mic on the market. The V KICK’s extremely low profile allows for effortless placement outside or inside a kick drum, and its integrated swivel joint allows for easy positioning inside (through the drum head port) or outside the kick drum. And with the stand mount and the XLR connector mounted side-by-side in parallel on the underside of the mic, your mic cables stay flush with the mic stand – no cable clutter, completely minimal footprint, and easy to place anywhere. The all-new custom DMC7 SB capsule offers the same technologies and features as its siblings within the acclaimed V7 and V7 X, including the innovative, specialized aluminum voice coil. While the V7 X is optimized for most other instruments, the capsule in the V KICK has been custom-tuned for the very lowest and loudest tones. With aluminum being a much lighter material than the industry standard (copper), it delivers an open and transient-rich sound, with effortless capture of low frequency energy and punch. The midrange is also extremely balanced, supporting the natural resonances of percussive instruments. The excellent off-axis rejection of this sophisticated capsule also helps isolate your kick drum from other sound sources on the stage - efficiently reducing stage bleed and spill from snare, toms, hi-hat and more. The supercardioid pattern also allows you to easily tailor the bottom-end by adjusting the proximity effect – i.e. distance to the sound source. The V KICK’s advanced internal capsule suspension efficiently decouples the capsule from mechanical vibration, isolating it from shocks & jolts and eliminating the need for an external shock mount. The V KICK's road-ready chassis is all metal, with no fragile plastic parts. The chassis' high quality, highly durable die-cast zinc alloy is designed to hold up under on-stage stress for years, the spring steel mesh grille is dent-proof and corrosion-free for perfect reliability, and the tightening knob for the swivel mount maintains a rock-solid hold on the V KICK in any position. Plus, the V KICK's gold-plated XLR connector ensures a loss-free and reliable signal connection for years to come. Some popular drum mic mounting systems (such as the LP®Mic Claw) include a knurled nut to secure the mic in position. However, these third-party nuts may partially block the XLR connector on the V KICK due to its extremely space-efficient design – so we have included a knurled nut with a smaller outer diameter to solve this problem for you. All in all, the V KICK makes it easy to get any kick sound you need. You can always make the right choice - with just a single microphone. Superior isolation & effortless sonics, all with minimal footprint & maximum flexibility. Hear the V KICK's different settings for both the left-hand switch (overall voicing) and right-hand switch (high-frequency / transient character). "CLASSIC+CLASSIC" means both switches are set in the top position, "CLASSIC+MODERN" means left switch up / right switch down, etc. Solo kick and full kit tracks are provided for context. No compression, EQ, or other processing has been applied.